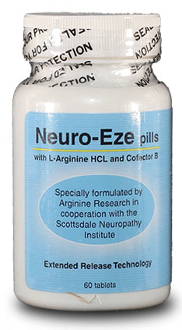 Neuro-eze Pills were specially formulated by Arginine Research in cooperation with the Scottsdale Neuropathy Institute. Each neuro-eze product contains L-Arginine HCL. Thses extended release pills help build up and restore the lining of blood vessels.